Inmates from Pattaya Remand Prison were drafted to scrape out clogged sewers on Jomtien Second Road. 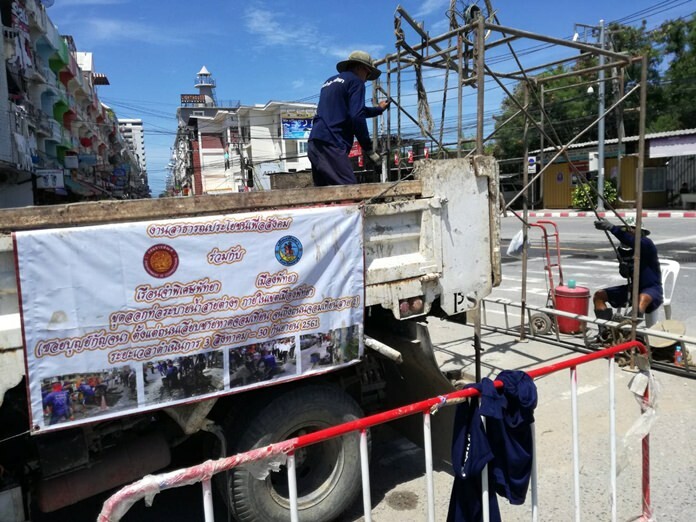 Well-behaved convicts, under the direction of guards and Pattaya sanitation workers, dredged the storm drains of mud and garbage from Soi Boonkanjanaram to Second Road. The Sept. 1 job was part of a two-month city campaign to clean out all the sewers in the city by Sept. 30 and the worst of the rainy season in October. In addition, workers repaired or replaced sewer grates and damaged cesspools. Previous articleFrom the sublime to the Gor blime!